Stumbling upon hidden gems in your own city is the ultimate local exploration. During one my frequent visits to The Art Institute, I decided to take a different walk back to the train. Upon doing so, I found a mysterious sign attached to a lovely brick wall, labeled “Pickwick Place”. Rounding the corner I saw an adorable little alley with lights strung above and a coffee shop at the end. Walking down this quiet little lane made me feel like it makes it presence known to only those truly in need of great coffee. With Hero Coffee being located among the chaos in the loop, I am confident that several people walk by without stopping to notice the charm this shop offers. Entering this 275 square foot building was everything I imagined it would be. With barely room for 4 people, the exposed brick walls soar above with high ceilings and accents from reclaimed wine barrels. Digging into its history, this building turns out to be one of the oldest in Chicago with it originally being built as a stable in the 1850s, ultimately surviving the Great Chicago Fire of 1871. Can a spot like this offer this much charm and still serve great coffee? Yes, yes they can! Ordering what is known as the “Grandpa Sweater”, the coffee had perfect notes of cardamom and lavender. I happily sipped as I walked back to the train, and felt sad when it was all gone. Naturally I returned a few days later and tried another one of their specialties, The Gumball. Once again this was one of the best latte’s I have ever had. 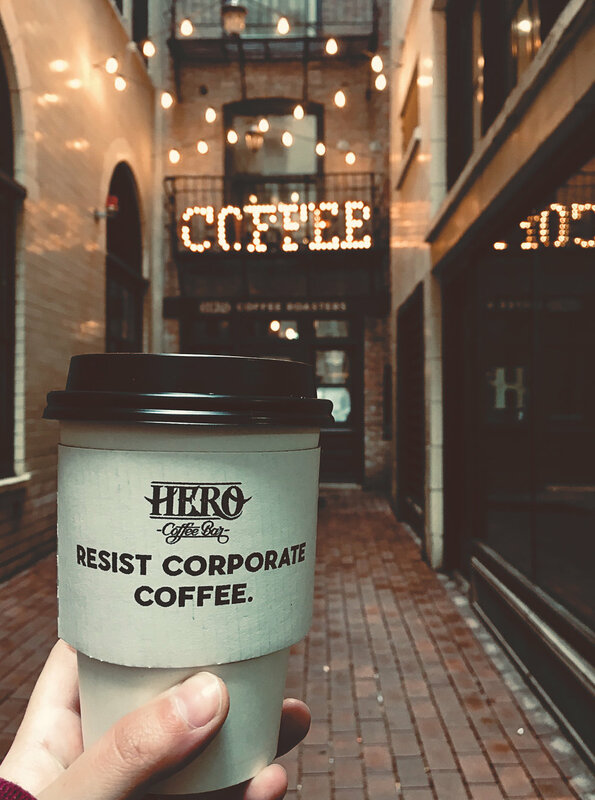 Well done Hero Coffee!